We went on vacation last week! Thus, this post is not *exclusively* about books. But I think you can probably guess that no vacation of mine would be complete without some reading and a few book-related activities. We made the drive to Colorado and spent some time tooling around the Rockies, hiking and exploring microbreweries. It may be only one state over from Kansas, but it feels like a different world (in the best possible way). Evidence: For a night or two we saw low temperatures in the 30s. * A white woman in her fifties who assisted me at REI had a head full of beautiful white dreads. ** Left Hand Brewing Co had a limited edition Jalapeno Cream Ale on tap in their tasting room that changed my life. In short, Colorado is amazing. You should go. I've explained before that I'm not a natural-born nature lover. Adam has, over the course of several years, slowly introduced me to outdoor activities, and I've just as slowly grown to enjoy them. Either that, or he's worn me down. Regardless, I like hiking now! A fact which mystifies and amuses certain of my longtime friends who have hiked with me in the past and found me less than cheerful company. This is how I look these days when hiking. Kind of a "Well, we're outside and we've got these bags all packed, so I guess we might as well walk along this path and see what happens" thing. Hesitant enthusiasm mixed with a healthy dose of resignation. Well, we have clear photographic evidence that dude loves hiking and outdoorsing. The payoff of walking 5 miles a day, especially at 9,000+ feet, is you have plenty of calories earned once you're done. And we cashed those in bigtime. 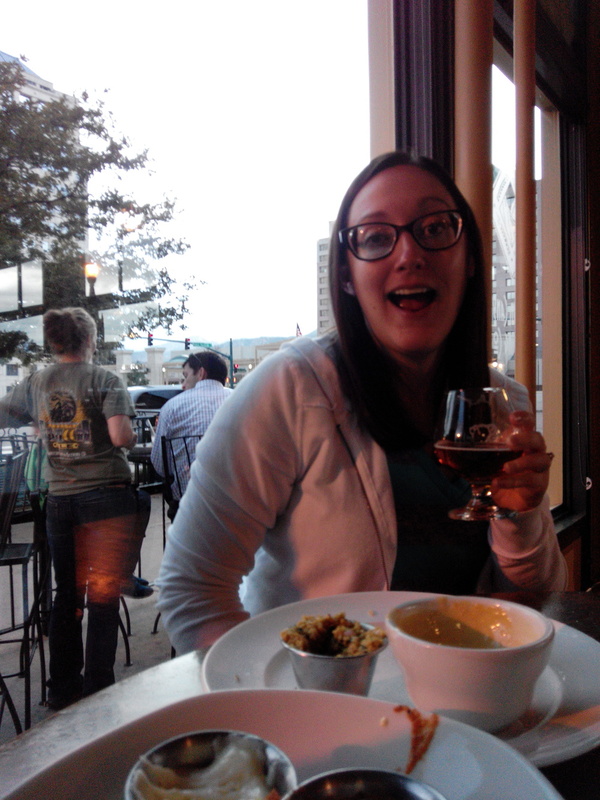 Seriously, if you love someone who loves beer, Colorado will be their Mecca. There are people doing amazing work there. The quality across the board was extremely high. I don't think I had a bad-tasting beer the entire trip. 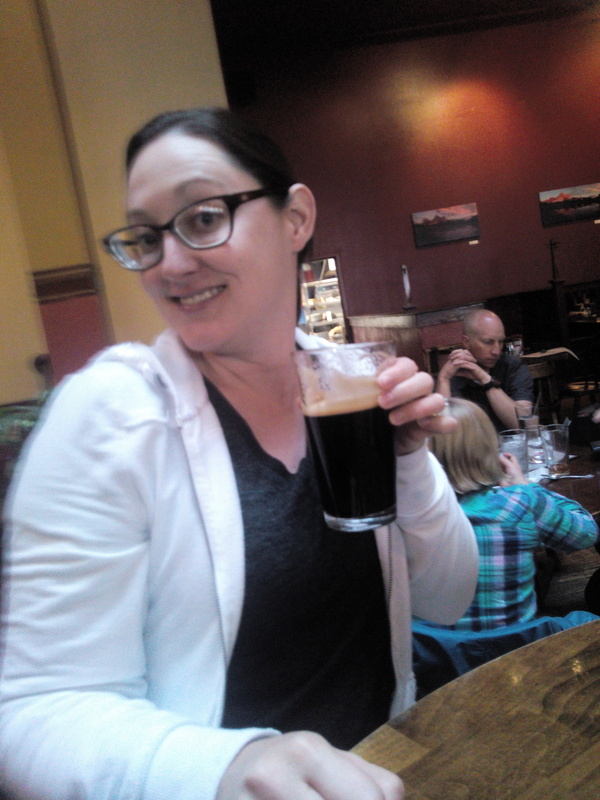 We especially liked Phantom Canyon Brewing, Odell Brewing Co, and the aforementioned Left Hand. Of course, I made a little time for reading too. I found myself thinking about Lies You Wanted to Hear often as we walked around downtown Fort Collins. (This post was brought to you straight from the lovely Bean Cycle coffee shop and bookstore--a winning combination and definitely worth a visit.) It was a great vacation read--totally absorbing, and raising some surprisingly deep ethical questions. We also did a little book shopping at my favorite Fort Collins bookstore, Old Firehouse Books. Spoiler alert: the building used to be a fire station. It's now home to one of the best fiction collections I've ever seen in a small, independent bookstore. Seriously, their buyer is doing a fabulous job. Adam said as we browsed, "I recognize so many of these books because I've seen them on Reading With Hippos." Apparently I share the bookseller's taste! Anyway, this week it's back to the business of life. Right now I'm reading Jonathan Strange and Mr Norrell by Susanna Clarke. It's long and pretty dense, so it may be a few days before you'll see a post about it, but I'm enjoying it so far. I have seen it referenced so many times I couldn't put off reading it any longer. I'm also looking forward to reading a couple of books I picked up during our travels: this and this. So that was our trip! Thanks for reading this unorthodox post. I'll be back soon with a recommendation for Jonathan Strange and Mr Norrell. In the meantime, if you haven't checked out the upcoming LiterScary Challenge, what are you waiting for?! We begin reading House of Leaves on October 1st! **I have secretly wanted white-girl dreads of my own for years. Maybe in my golden years I'll be brave enough to make it happen. Is it because of my ongoing Anne Lamott crush? Perhaps.